strength to avoid inter mixing of different building materials and the soil. 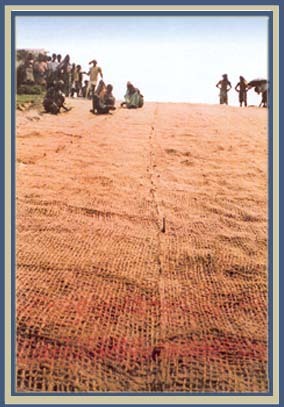 These are thick non woven fabrics which are effective and economic for the construction of trenches and interceptor drains for roads, when drainage of water is a problem as well as to replace conventional filter material. 1.Biodegradable,eco-friendly and environment friendly unlike the synthetic variety. 2. Biodegradability enhances soil retentivity and permeability. 4.Can easily be transported and laid at the site. 5.Can be customized as per the buyers requirements.